We recently took a look at how many shots Kobe Bryant is taking this season as it compares to his most recent full season (a LOT). But to get a better sense of just how much of a gunslinger he has become, let’s compare Kobe to the other top shooters in the NBA. Bryant is leading the NBA with 27.7 points per game but he has also taken 18 more shots than anybody else in the league. 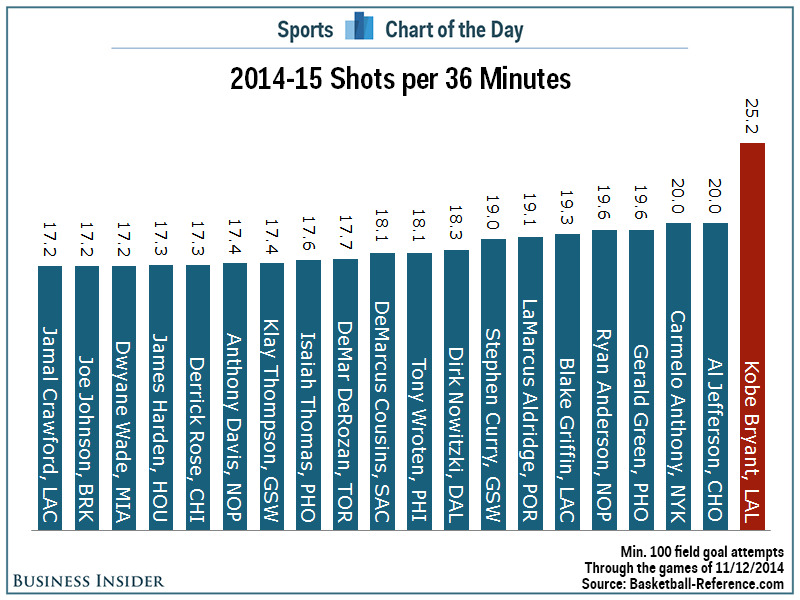 More importantly, he has taken those shots in one fewer game than the NBA’s second-most prolific shooter, Carmelo Anthony. 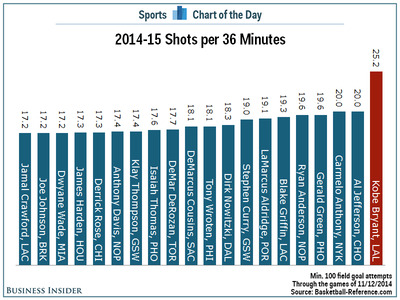 To put it another way, Kobe is taking 25.2 shots per 36 minutes, 5.2 more than anybody else this season. That would also be the most shots per 36 minutes in 33 years (George Gervin, 25.4 in 1981-82) and the fifth-most in the shot clock era (1954-55 through present; min. 50 games). And based on Kobe’s 54 shots taken in the last two nights combined, there is no sign that he plans to stop slinging anytime soon.